Inventing apps for iOS, Mac, ... and you! When Mac OS X "Tiger" appeared years ago with its intriguing Dashboard feature, I designed a widget to give my mother quick and easy access to the horoscopes she enjoyed reading. On a whim, I showed the project to the folks at Astrology.com, who surprisingly —and quite generously— offered me money to polish the widget for them. After close collaboration with their Web Technologist to develop a special-purpose horoscope data feed, and with an artist to create a refined and distinctive look, I produced the final result: Dashtrology, an attractive and unobtrusive window on daily celestial lore, for those who enjoy that kind of thing. It was a fun, creative project. In early 2007, Steve Jobs unveiled Apple's revolutionary iPhone; in mid-summer, he announced that the device's Safari browser would support third-party applications written with "Web 2.0" technology ... the same technology behind Dashboard widgets! One email to Astrology.com —"We've gotta do this! "— and I was on the job, adapting Dashtrology for Dashboard into iScopes for iPhone. Despite designing almost-blind, I and an artist did our best to mimic the look of the iPhone interface, and had the final product ready in time for iPhone Launch Day. Apparently, the results impressed Apple enough that they used (and, as of 22 July, 2012, still use) an iScopes screen-shot in promotional images on their web site; the picture at left is from Apple's page "What are web apps?" 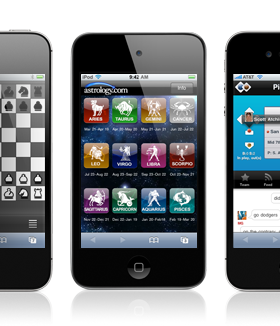 In 2008, Apple announced that iPhone would support native, on-device apps. An iScopes revamp was inevitable, of course, and it —along with iChing and iTarot, as well as my own educational app, Trigger— appeared among just 500 apps available the day the App Store launched. The spinnable zodiac wheel. 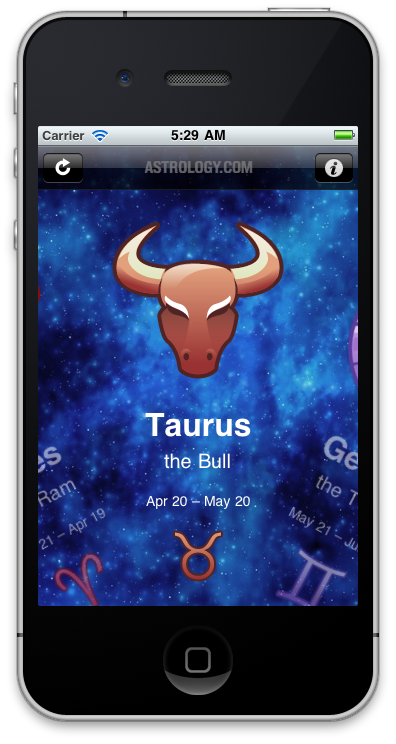 Swiping the wheel this way and that made the app experience fun, while filling the screen with the selected astrological sign made it personal. Use of the on-device Contacts list to add "Contacts" as the wheel's 13th Sign, which allows the checking of friends' horoscopes without having to remember their signs. An Apple engineer once mentioned to me that he and his colleagues "knew of" iScopes, and that he had only been able to offer sympathy to an app maker who had lamented to him, "How am I supposed to compete with [iScopes]? ", saying, "That's up to you, but it's a pretty amazing app." Not bad for a project that started, essentially by accident, as a favor for my mother. Day Late & Dollar Short, DL&DS, DL'n'DS, tricochet, the triple-ricochet motif, CueType, Trigger, Tri, piClock, Solly, and Cross Eyes are trademarks of B.D.S.McConnell. iPhone, iPad, and Mac are trademarks or registered trademarks of Apple, Inc.